Employee engagement begins with an organization’s leaders. Employee engagement involves intentional, ongoing processes to inspire innovation, performance, commitment, and excellence. Engaged employees are more involved, enthusiastic, and committed to their work and organization than disengaged employees. Leaders who foster high levels of employee engagement are mindfully present, observant, and enthusiastically reward and celebrate individual and collective accomplishments in meaningful ways. Management expert Ken Blanchard once said, “What motivates people is what motivates people” meaning that each person is motivated in his or her own way and by his or her own unique aspirations and preferences. To say that people are demotivated or unmotivated is generally missing the point. In fact, most if not all employees are motivated, just in different ways and by various factors. Therefore, instead of focusing on motivation per se, leaders will achieve better results by strengthening and rewarding employee engagement. Motivation is often considered an inconsistent, short-term approach for influencing employees. Investing in employee engagement initiatives, on the other hand, is a more deeply rooted, intentional, ongoing process to inspire employee innovation and performance and to promote commitment to the organization’s vision and mission. What’s the benefit of employee engagement? Engaged employees are more involved, enthusiastic, and committed to their work than disengaged employees. They believe the work they’re doing is important and that they’re vital contributors to the organization’s success. They’re more supportive of the organizational vision, mission, and strategic goals; speak positively about the company; and support colleagues and other healthcare team members. Conversely, disengaged employees lack energy and passion for their work, often act out their unhappiness, and in some cases, may undermine other employees’ accomplishments. Unfortunately, according to a Gallup poll, only 32% of American workers say they’re engaged at work; 51% indicate they’re actively looking for a new job or checking for new job openings. These numbers underscore the need to develop and implement processes for building and measuring employee engagement and linking that engagement to performance. Increased employee engagement leads to greater productivity, a heightened commitment to the organization, and improved patient care and quality outcomes. Follow these tips to improve employee engagement. Lead with optimism. Leaders play a key role in fostering employee engagement. Projecting a positive attitude about the organization, work environment, professional role, and life in general can have a significant impact on employee engagement and morale. In addition to being skilled and competent managers, leaders act as role models by setting a professional, positive tone and leading by example. Beginning each day with an optimistic outlook can provide an energy boost that improves employee engagement and morale. Create a healthy, positive work environment. Fostering a culture of trust and respect positively affects employee engagement and plays an essential role in strengthening work satisfaction, relationships, and collegiality. A welcoming and friendly work environment that emphasizes teamwork and an esprit de corps among all employees at all levels of the organization enhances interpersonal and organizational trust, employee engagement, and an overall sense of community. This healthy, productive work environment is essential for ensuring patient safety. Be visible and available. Skillful leaders are visible, available, and approachable in the workplace. Effective leaders engage with staff, patients, and families—not to check up on employees, but rather to genuinely interact and converse and to be available to team members. Many managers proclaim to have an open-door policy, which generally refers to extending an open invitation for employees to visit and share ideas with the manager in his or her office. However, a better way to view this policy is to have the manager open the door and walk through it on his or her way to spending meaningful time in the workplace to build goodwill and engage with staff. Foster interpersonal and organizational trust. Effective leaders keep their word, inspire trust, and build confidence among team members. Interpersonal and organizational trust must be earned, and both stem from an intentional effort to follow through and align one’s behavior and values with the institutional vision, mission, and shared values. Great leaders cultivate a work culture where each employee is treated with respect and civility and trusted to fulfill the organization’s strategic goals. They promote an environment where meaningful, frequent, and open communication prevails. These factors help to create an environment where employees feel appreciated and thus become highly motivated to accomplish their work. Cultivate relationships. Building, developing, and sustaining relationships takes focus, discipline, and dedication—and is at the heart of creating an engaged workforce. Effective leaders understand and appreciate others’ needs, and as a result, they pay careful attention to individual and collective relationship building. This requires leaders to understand each individual’s needs and to provide an environment of open communication and transparency. Effective leaders listen well; encourage others to share ideas, concerns, and varying perspectives; and welcome new ways of doing things. They realize that employees will be more motivated to work hard and try new things if their leader acknowledges their efforts. Set clear goals and provide feedback. Employees succeed when they understand and embrace their performance goals, have the necessary resources to accomplish the work, and receive ongoing feedback about meeting their goals. They want to know that the work they’re doing is meaningful and worthwhile. If employees are unclear about how they’re performing, or if their contributions go unnoticed, they may assume that their work is unimportant. Providing ongoing feedback helps employees feel engaged, connected, and involved. Provide meaningful work. Each employee perceives the positive value of his or her work through a personal lens. The best and most effective way for a leader to provide meaningful work is to ask team members to define it for themselves and to suggest ways to accomplish it. Most meaningful work isn’t driven by monetary compensation. Employees want to engage in work that matters—personally, organizationally, and societally. Leaders can enhance engagement by helping employees align their personal and professional goals with those of the institution. Encourage autonomy and individual growth. Many employees do their best work when allowed to practice autonomously and when given the opportunity to make decisions that impact their work environment. This doesn’t mean they work in isolation or without supervision. Rather, autonomy means creating an environment that allows employees to work both independently and collaboratively to make sound clinical decisions about delivering safe patient care. Fostering professional autonomy improves employee engagement, enhances patient care outcomes, and elevates the status of the profession. Employees feel engaged when employers are invested in them, allow them to make important and well-informed decisions, and provide opportunities to expand and develop their self-governance skills. Communicate and be transparent. The need for effective and open communication at work can’t be underestimated. This is especially true in technologically advanced practice settings where nurses care for seriously ill patients with complex diagnoses. These conditions require clear, ongoing, effective communication among healthcare team members, as well as with patients and their families. Open, transparent communication is also essential at the institutional level—employees need to be connected and informed. Offering opportunities for employees to voice and exchange ideas, concerns, and comments helps keep the lines of communication open and fluid. Use simple, powerful strategies to engage employees. The Blanchard quote, “What motivates people is what motivates people,” means that leaders and managers are well served to ask employees how they wish to be rewarded so they receive valued and meaningful recognition. Offering sincere, targeted, and specific feedback can go a long way to enhance employee engagement. Fostering and sustaining high employee engagement is both challenging and rewarding. Ultimately, it requires being present, paying close attention to others’ contributions, recognizing individual and collective accomplishments in meaningful ways, and celebrating the countless benefits of an engaged, high-performing work team. Cynthia Clark is the strategic nursing advisor for ATI Nursing Education and the author of Creating & Sustaining Civility in Nursing Education, 2nd edition. 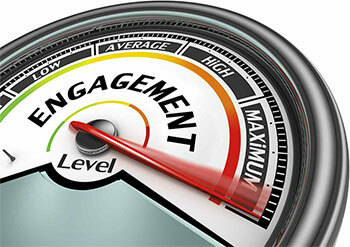 Gallup daily: U.S. employee engagement. Gallup News. Marciano PL. Carrots and Sticks Don’t Work: Build a Culture of Employee Engagement with the Principles of RESPECT. New York: McGraw-Hill; 2010. Kruse KE. Employee Engagement 2.0: How to Motivate Your Team for High Performance (A “Real-World” Guide for Busy Managers). 2nd ed. Richboro, PA: The Kruse Group; 2012. Younger HR. The 7 Intuitive Laws of Employee Loyalty: Fascinating Truths About What It Takes to Create Truly Loyal and Engaged Employees. Boulder, CO: LeadU Publishing; 2017. The impaired nurse: Would you know what to do if you suspected substance abuse?